Here's a horrifying diarrhea sandwich of a situation. A truck loaded with live eels bound to be exported "to [South] Korea for consumption" overturned on Oregon's Highway 101. The details of the accident haven't been released, but the results are clear. 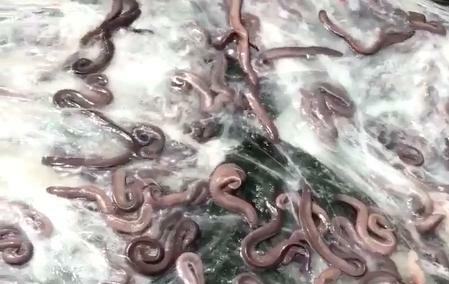 Hundreds of live eels and a sickening amount of thick goo gushed across the highway. Additionally, one quite unfortunate sedan saw things. All told, 750 pounds of fish was dumped onto the road, according to The Oregonian. Technically, these are hagfish, but their snake-like bodies and the fact that they secrete slime when distressed has earned them the barf-tastic nickname of "slime eels." Both the Oregon State Police and the Depoe Bay Fire Department were on the scene to help and, for anyone who has never seen a scene like this, tweet out photos of the accident. Fortunately, the Fire Department says, no one was hurt. Though, there are some eels who might have a bone to pick with that statement. The whole thing makes you want to call Dana Scully and Fox Mulder before the evidence is whisked away.